Venturing lives up to its name taking adventure to new heights. Open to boys and girls ages 13 (and completed eighth grade) or 14 through 20, this co-ed program focuses squarely on outdoor survival. As a Venturer, you’ll learn wilderness skills — from orienteering to running rapids to rappelling cliffs to shooting firearms. You’ll use modern technology like GPS while also learning to read maps and use a compass. You’ll tackle backcountry first aid and survival in the harshest weather. You’ll be pushed, challenged and grow stronger, surer and more capable with every outing. In Montana, there are Venturing crews in most of the larger communities. These crews participate in traditional scouting events such as banquets, fairs and campouts, but also engage in backcountry and adventure camp activities on a routine basis. Parents, friends and leaders play active roles in the program as they help the boys and girls achieve their goals as confident backcountry travelers. 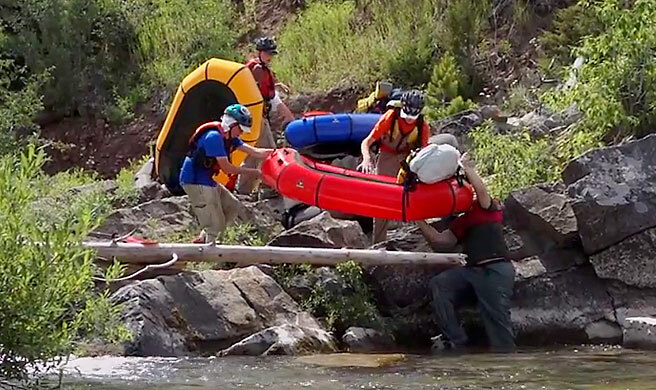 Montana is also home to several of BSA’s premier adventure camps, a few of which offer programs specifically for Venturers. These camps include Melita Island, Camp Arcola, K–M Ranch and the Montana Outdoor High Adventure Base. Boys and girls may join Venturing at age 14 and participate through age 20. Start the adventure today by attending a meeting in your community.